Telstra has launched court action over alleged trademark infringement involving its ‘no frills’ broadband subsidiary Belong. Late last week the company filed a lawsuit in the Victorian registry of the Federal Court against BelongEnergy Pty Ltd.
“We have commenced legal proceedings against a company named BelongEnergy for trademark infringement, after several attempts to resolve the situation directly with them failed,” a Telstra spokesperson told Computerworld. “We are disappointed to take these measures but feel it’s the only way to protect consumers from being misled and to protect our brand and reputation as a safe and reliable provider of essential services for Australians,” the spokesperson said in a statement. Telstra launched Belong originally as a discount fixed-line broadband provider in 2013. In 2017, Belong added mobile services to its product line-up. As of the end of December, the subsidiary had around 225,000 broadband customers, up 25 per cent compared to the end of 2017 (Belong had around 132,000 NBN services in operation as of 31 December). In the six months to 31 December, Telstra said that Belong added 115,000 postpaid mobile services, ending the year with 182,000 mobile services. “We launched Belong Mobile as part of our multi brand strategy a little over a year ago and we are very pleased with our performance to date,” Telstra CEO Andrew Penn last month told the telco’s half-year results briefing. “Belong’s a very different value proposition,” he said. 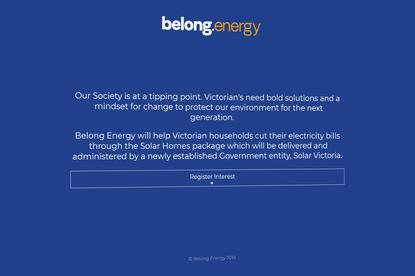 The Belong Energy webpage invites Victorians to register their interest in its services. “Our Society is at a tipping point,” the webpage says. “Victorian's need bold solutions and a mindset for change to protect our environment for the next generation. The site is registered to Trevinder Gill, who lists himself as a senior financial officer at SunEnergy on his LinkedIn profile (Gill didn’t respond to a request for comment). A business name of belongenergy that shares the same address listed on the belond.energy domain was registered in December 2018 but cancelled in February. The business owner was listed as Sappap Pty Ltd.